Swim meets cannot run smoothly without an army of volunteers. Each family is expected to work the equivalent of one full meet. That can be any combination of half meets by one or more parents. Of course working more than that is greatly appreciated. Job assignments are typically assigned by halves, for example first half Deck Manager and second half Deck Manager. Halves are define by Events and not time periods like other sporting events. The first half is events 1 to 43, and the second half is 44 to 86. 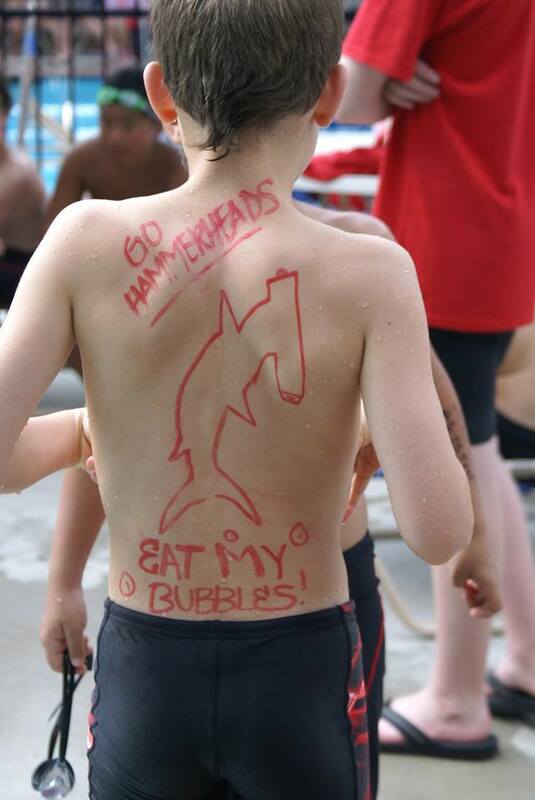 Family members can volunteer for sessions on the Hammerhead Swim Team Portal, http://huntleyhills.swim-team.us/ . You must login with your user account. Job assignments are first come, first serve. Pre-Meet Setup: Assist with configuring the pool for a swim meet. Some typical activities include moving tables and chairs, setting up tables, installing starting blocks, lane ropes, backstroke flags and referee setback flags. Deck Manager: A deck manager is in charge of the ready area and shall line up all swimmers on the deck for their event. He/she shall be provided with the heat sheet listing names of all swimmers in all events. He/she shall notify each swimmer to wait behind the starting block until the starter takes over control of the race. The visiting team shall arrange for someone to work in the ready area to assist the deck manager in identifying swimmers. These people should be strong natured. Getting the swimmers and making sure that they are in place is difficult yet critical to the smooth running of the meet. Bullpen: Bullpen worker(s) assist the Deck Manager in finding and tracking down swimmers who are hopefully in the team bullpen. The Deck Manger usually works near the starting blocks and the bullpen worker "hands-off" the swimmers to them. Prior to the meet bullpen workers assist the coaches to make sure that every swimmer has all of their Events, Heats, and Lanes marked on their arm. After the meet Bullpen workers make sure all "misplaced" items are collected for the team lost and found and that the bullpen area is left in tidy manner. Bullpen workers must be assertive with the children are typically long time parents because knowing all or most of the swimmers by name is a huge advantage. Place Judge: Each team shall provide a place judge. The judges must attend all events and command a clear view of the race and finish line at all times. Judges shall not serve as timers in the same race. The judges are to judge the place finishes as they see them and write the the names on their copy of the meet program. At the end of the race, the Judge's Recorder (see below) will copy the order of finish on the UK Judges Placing Form. The place judges override the times and the starter/referee over rides the place judges if there is a dispute. Judges Recorder: This person will place himself/herself behind the place judges with their own copy of the UK Judges Placing Form. When the race is finished and the judges and starter/referee have ruled on the place finishes, he/she will record the places in the appropriate block on the UK Judges Placing Form. For swimmers who have been disqualified by the starter/referee the judges recorder will write DQ in the place block for that swimmer. The judges recorder then passes the completed UK Judges Placing Form to the master recorder. The Judges Recorder has no say in the order of finish and should not attempt to influence the place judges. Master Recorder: The master recorder collects the UK Judges Placing Form from the Judges Recorder when the event is complete and all places have been recorded. The master recorder will then go to each lane and record each swimmer's time in the Time Column of the UK Judges Placing Form as noted by the recording timer. With all places and times recorded, the master recorder will deliver the completed UK Judges Placing Form to the scoring table either directly or via the runner. Each team can alternate this job for each race. Lane Timers: At all meets times shall be taken on each lane. Each team shall provide two timers for each of their team's lanes. One of the timers will operate the watch and the other will record the times on the lane timer worksheet. In all events, at all times, the timer must have a clear view of the race and finish line. The timer shall look at the starters gun and start the watch at the instant of the flash or smoke of the gun or starting device. The timer shall stop the watch immediately when any part of the swimmers body touches the solid end of the pool as defined by the USS rulebook. The second timer shall record times on the timers worksheet and communicate these times to the master recorder who shall record them on the score sheet. Teams using automatic timing systems for their meets should have one timer from each team timing in each lane, instead of 2 timers from the same team. Computer Operator: A computer operator shall be provided from each team. They shall work together at the scoring table. They will input the results from each event as reflected on the completed UK Judges Placing Form into the computer immediately after each event. A running score shall be kept at all times. Upon completion of the meet each team shall receive a copy of the final meet results. It is suggested that teams alternate this job every group of events: i.e. one operator does the short free then the other operator does the long free. The person who is not currently working on the computer should assist the computer operator with checking the input of times and places. The away meet Computer Operator role is typically just a data entry role, calling out times to the home meet operator who is entering the times. Away meets are usually a great introduction and learning experience. Computer Operators must be experienced or trained prior to working home meets due to the many tasks involved. Pre-Season ASA Swim League training is highly encouraged. !!! Announcer: The host team will arrange for someone to act as announcer. In addition they shall provide him with equipment to perform his duty. This equipment includes loudspeaker or bullhorn and an order of events. Announcing for each meet must be loud enough to be understood by participants, officials and spectators. At all times the announcer should know what is going on. The event number, number of heats per event etc. so the calls can be made without haste. This keeps the meet running smoothly. At all times the next event should be on the deck. Working closely and communicating with the deck manager is vitally important in this position. The announcer should avoid talking while the starter is giving commands the swimmers. Ribbons: Ribbon workers shall be responsible for placing the completed ribbon labels on the appropriate award and placing them into a box for the appropriate team. Ribbons should be placed in two separate boxes and given to each team at the end of the meet. Home teams supply ribbons for both teams. Most swim teams, including the Hammerheads, put their ribbon workers in the air-conditioned club house away from the chaos of the meet. However, workers have freedom to work where they please if they want to work and watch the action. This job can either be done during the meet or at home after the meet. In either case, ribbons must be ready for distribution at the beginning of practice the next morning. Concessions: Configure the concession area for food and drink sales. Put drinks on ice as soon as possible. Insure there is a money box with starter bills provided by Swim Team Manager. After the meet count the money and deliver to a Swim Team Manger. Stow items and clean-up/lock-up concession area. Grill Master: 1 to 2 Grill workers are needed to insure the concession stand is continually stocked with fresh burger and dogs. Post Meet Clean-up: Assist the team with reconfiguring the pool for normal operations. This may include stowing swim team equipment and moving tables and chairs. Clean-up and trash removal are likely.